and turned to Angelic Events to arrange something really memorable. A special 40th birthday party for French twins, who now both live in the UK. and turned to us to arrange something really memorable. The stunning beaches of Karpaz created a perfect setting to wow the guests arriving from overseas. To make the occasion special and make the most of the surroundings, we arranged luxury tents for a glamping experience in a private, remote location for all the guests, rather than hotels. waiting for guests when they woke up in the morning. As well as glamping, we arranged all of the entertainment and activities for the brothers and their guests. This included things like a private boat cruise, watersports, and luxurious massages and yoga sessions with local experts on the beach. 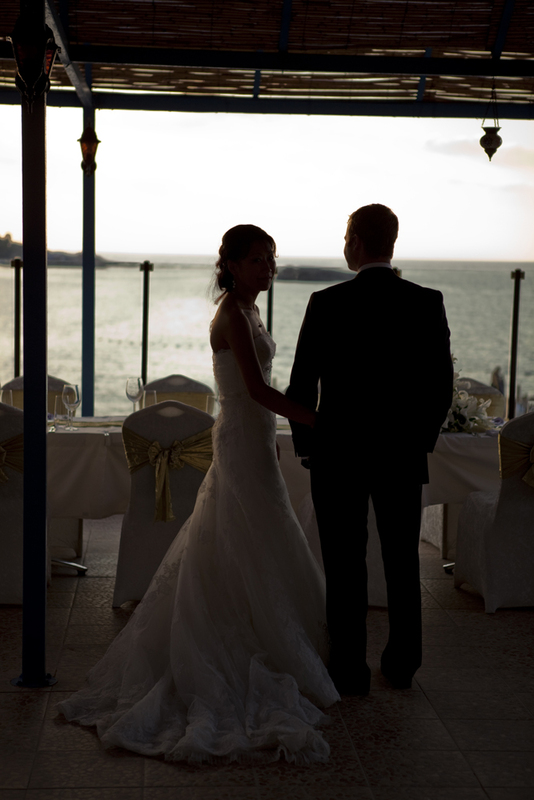 ​With families in Britain and Kazakhstan and an engagement in Bangkok, the wedding of Oliver and Darya Slevin was always going to have an international flavour, and in North Cyprus they found the dream location for their perfect day. Oliver and Darya Slevin married on 16th September 2011. The ceremony took place under the ancient, dramatic arches of Bellapais Abbey, overlooked by mountains and with views of the Mediterranean in the background. The wedding party then moved on to Merit Crystal Cove Hotel for a luxurious reception, with the sea creating a soundtrack of gentle waves as the sun set. Having the wedding in North Cyprus meant there were no long haul flights or visa complications to worry about, so Oliver and Darya were able to share their big day with all their loved ones from the UK and Kazakhstan. They used Angelic Events to coordinate all paperwork and bookings, and to source trusted local suppliers for personalised touches like food, hair and cakes. Darya wore a beautiful, traditional white dress from San Patrick, complimented by a bouquet of crisp white roses. After the ceremony Darya changed into a new outfit for the evening, allowing her to stay cool and comfortable in the Cyprus sun, but keep the beauty and grandeur of a traditional wedding for the photographs. The food added a local flavour to the reception as guests were treated to a feast of meze, roasted veal and delicious Turkish desserts. Having the wedding in such an ideal tourist destination allowed the couple to spend two weeks in the sun with their friends and family. Oliver and Darya had then planned a delayed honeymoon the year after the wedding, but within a month the couple were delighted to find out Darya was expecting their first baby. 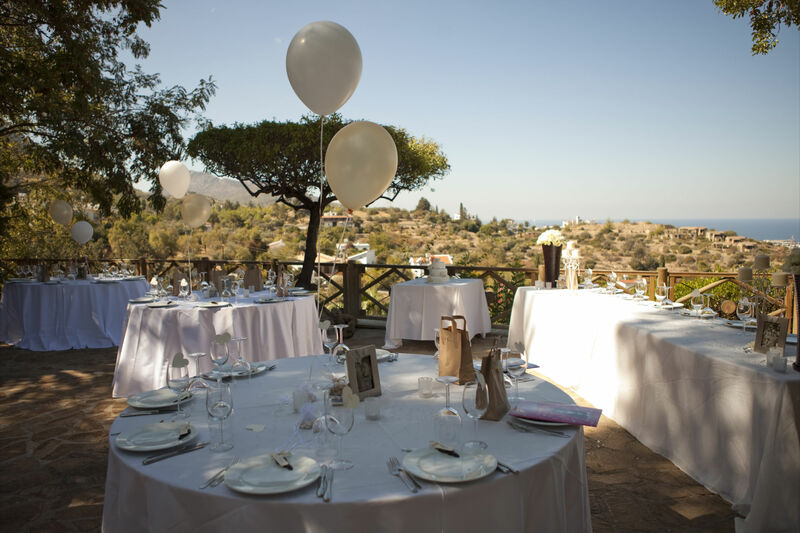 “If you are going to get married abroad it definitely helps to have someone local to sort out the paperwork, especially instances where people need to attend – without a wedding planner based in North Cyprus it wouldn’t have been achievable,” says Darya. ​After getting engaged in front of a Cypriot sunset and falling in love with a beautiful ruined abbey, there was no doubt where Lauren and Stuart Jones were going to choose for their special day. With a modest budget, an experienced event company and a little help from their friends, they created an unforgettable wedding day in front of a stunning backdrop of sea, mountains and stone arches in North Cyprus. Lauren and Stuart Jones married on 21st October 2011. With such a breath taking backdrop already in place, Lauren and Stuart wanted a traditional theme with ivory, champagne and pearls as the main colours to compliment the venue. Lauren also wore a classic ivory silk dress by Maggie Sotero, with corset back and diamond and pearl details, accompanied by a bouquet of off-white roses. Guests were treated to a delicious spread of local dishes, including mese-style starters, grilled chicken and vegetables and Turkish style cheesecake, followed by their traditional 3-tier fruit cake. “I honestly wouldn’t have done a thing differently” says Lauren.